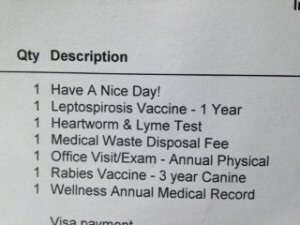 … took my dog to the vet. The receipt (pictured below), included some friendly-ish words. All with the best of intentions, I’m sure, but when we start adding automated cliches as line items on our invoices, you have to wonder how this is of any value. Automation is fine. But the more things you can do that don’t scale, the harder it is for your larger competitors to keep up with you. You might have a good point there, Kathryn! Although I would hope that if the message were for her, they would at least included a couple of Woof Woofs! in the greeting. I’m glad you got your annual checkup. Taking care of your health is important.